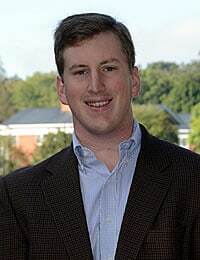 Tyler Sanderson ’18L, a graduate of Centre College from Henrico, Virginia, spent the summer working for the U.S. House of Representatives Committee on the Judiciary in Washington, D.C. I worked as a law clerk with the U.S. House of Representatives Committee on the Judiciary in Washington, D.C. Specifically, I was assigned to the Subcommittee on Crime, Terrorism, Homeland Security, and Investigations. Having completed policy work in D.C. prior to law school, I knew that I wanted to get back to that arena my first summer after 1L year. Fortunately for me, W&L is very well connected in Washington, and I was able to take full advantage of those connections when applying to intern with the House Judiciary Committee. The Chairman of the House Judiciary Committee, Representative Bob Goodlatte, is himself a Washington and Lee Law alumnus. A good friend of mine from a previous internship, who is also an alumnae of the undergraduate university, was working in Representative Goodlatte’s personal office on Capitol Hill at the time of my application. I sent her an email and she responded immediately, offering to contact the intern coordinator and put in a good word for me. W&L’s alumni network is truly phenomenal, and really helped me get my foot in the door with the Judiciary Committee. Similar to most offices on Capitol Hill, my responsibilities and assignments generally revolved around what was happening that day. As the only law clerk assigned to the Crime Subcommittee, much of my work focused on some of the nation’s larger stories and headlines that took place over the summer. The week after the horrific shooting at a gay night club in Orlando, I was tasked with continually updating Subcommittee attorneys on the details surrounding the shooting and any information that came to light on the gunman. In response to the shooting, I had the opportunity to draft a number of legal memos, one of which was requested by the Chairman of the Judiciary and pertained to the constitutionality of deactivating radical jihadist websites with the goal of combating self-radicalization and lone-wolf terrorism. In addition, I also was tasked with researching and drafting legal memos on a number of different subject areas, including criminal justice reform, the constitutionality of prosecuting juveniles as adult offenders in cases of violent crime, and ongoing efforts to strengthen international law enforcement cooperation. My internship with the House Judiciary Committee was a fantastic place to spend the summer, and I highly recommend it to anyone with an interest in public policy. Not only was the work fascinating and academically stimulating, but the attorneys I had the opportunity to work under at the Crime Subcommittee were incredibly approachable and always happy to offer any career advice and suggestions. I also greatly enjoyed the fast paced nature of the office. While I often was tasked with lengthier research projects, there were plenty of times when I was asked to research issues surrounding pending legislation and report back quickly to our chief counsel, so that she could then pass along any relevant information to the Judiciary Chairman. While I knew that I had a strong interest in public policy coming into law school, my experience with the House Judiciary Committee has confirmed my desire to pursue a career in government. It is my hope to be back in Washington, D.C. next summer, either working for a federal agency or a committee on Capitol Hill.